As you know, my mom, pops, and I are soaking up the sun in Carlsbad (San Diego) for the next couple days. 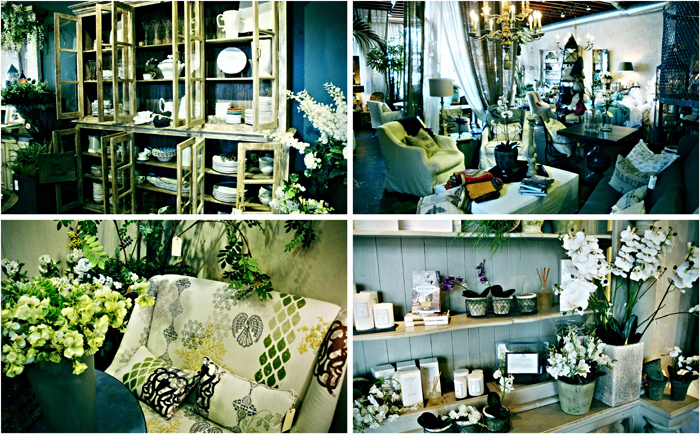 We ambled up and down the coast today, stopping at beaches, flower shops, and interior decor stores along the way. Here's some of the hot spots we came across! You know how some shops are just chock full of so many pretty and inspiring goodies you feel like your head might just explode? Garden-ology is one of those shops. It is by far one of my most favorite home decor store in all of Southern California, and my mom and I never come here without making a pit stop there to check out all the latest and greatest brands found in this shop. The feel of Garden-ology is sophisticated yet casual with a European vibe, bringing the natural beauty of gardens (and the beach!) into the home in a very elegant way. Beautifully scented Archipelago candles line the shelves, mossy greens and blooming flowers adorn the tables and shop walls, sparkling vintage crystal chandeliers hang from the cieling, and relaxed linen, burlap, and herringbone fabrics are draped about the store.I could literally spend hours in this shop....and that printed settee has me going gaga! Bixby & Ball was a new discovery today, and I couldn't be happier to have stumbled across this charming shop inspired by the coastal lifestyle. 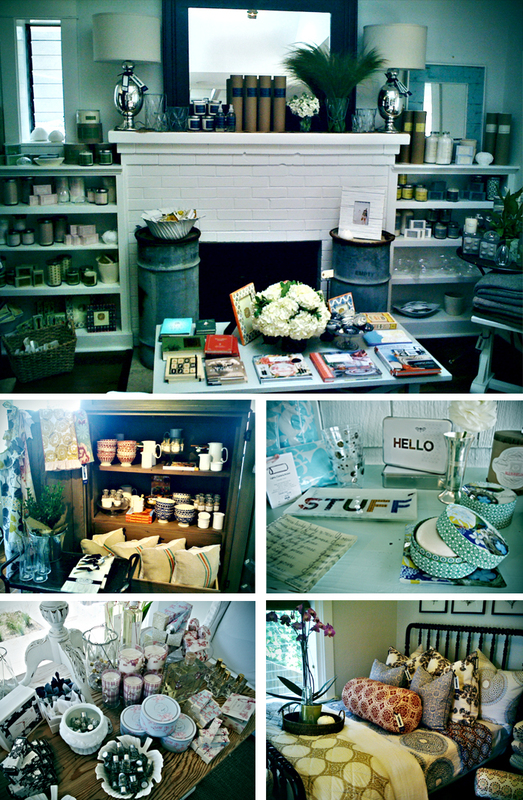 The space, a cottage originally built in the 1920s, houses Lollia beauty products, Voluspa candles, bedding with a wonderfully bohemian feel, colorful glassware, home accessories, furniture, and much more. The two owners, Melissa and Betsy, couldn't have been lovelier, and had just wrapped up a news segment on how to throw a royal wedding viewing party...the perfect fit since this felt like a little beach bungalow fit for a queen. Bon Bon Home & Garden is a shop with a whole lot of inventory to dig through....some things can get a bit kitchsy and overly cutesy, but they have some real gems there. The Chinese garden stools were especially eye-catching, and I loved their assortment of striped pillows with a perfectly beachy vibe. 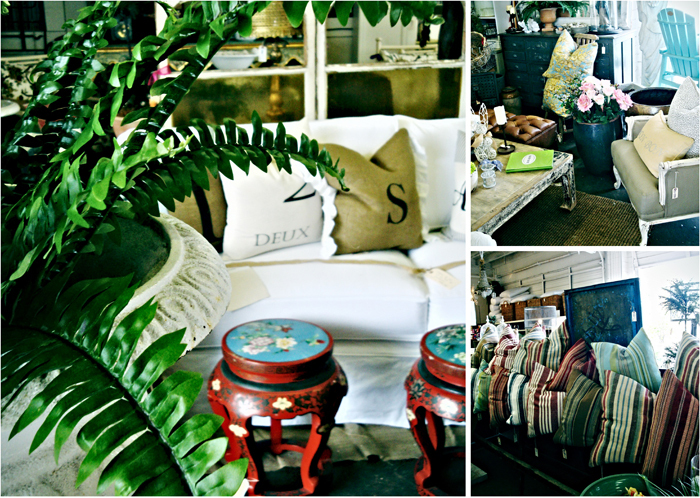 If you are looking for some shabby chic decor encrusted with bling, this is your one-stop shop. Ready to discover a unique mix of art, accessories and furniture from around the world? Look no further than David Alan....I guess you could call it a shop specializing in Asian fusion, tropical modern or contemporary rustic styles. 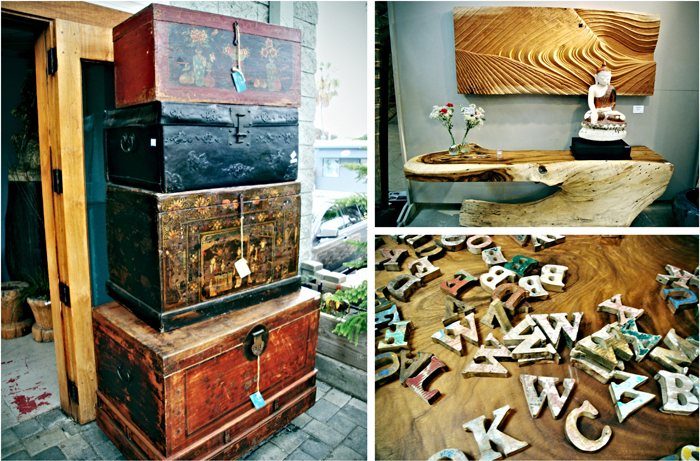 Whatever you decide, I know one thing - the wood pieces featured in this shop truly are awe-inspiring. You can find huge slabs of wood planed to make the most beautiful tables and furniture, antique doors imported from Bali, intricately carved art, antique Chinese armoires, centuries old pottery… the list goes on and on. Perfectly distressed furniture? Check! The contrast of bright and neutral pieces mixed in together? Love! Amazing prices (as in "Is there supposed to be another zero after this?")? You bet! In short, Rustic Rooster rocks my socks off.....I love the playful and carefully curated selection of coastal furniture and accessories. 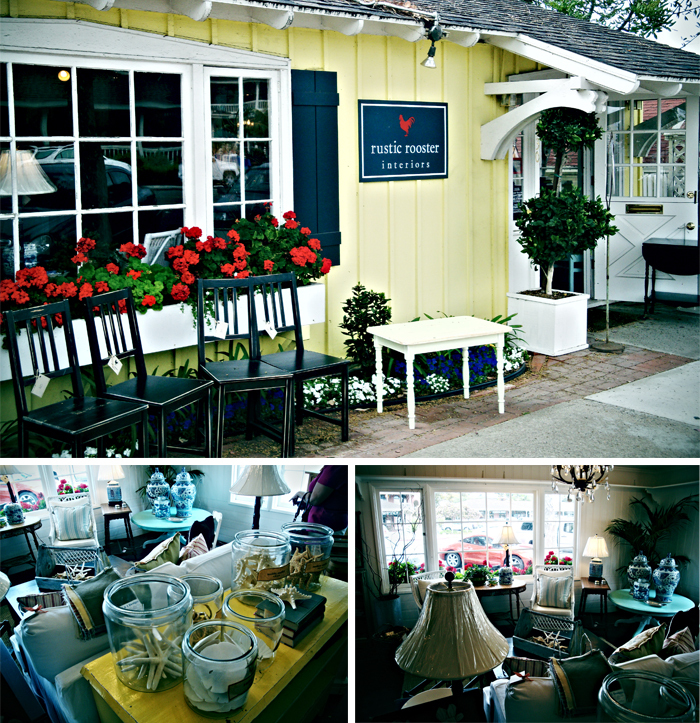 This quaint and unassuming cottage houses some of the best deals in Encinitas in my opinion, and the ladies (an adorable mother-daughter design team) at Rustic Rooster acquire only what they love and would have in their own homes. I dig that....bravo, Rustic Rooster! Now, I can honestly say I have saved one of the best for last. You know how I mentioned the head exploding inspiration earlier? Ya, I went kablooie in SoLo. To enhance the home, SoLo’s super cool and industrial-chic 4,000 square feet shop features Eames, Knoll, mid-century modern and vintage American furniture, British Kaki, Dos Dueños pewter, semiprecious jewelry, fine designer stationery and modern hand-blown glasswork. There is literally too much good stuff to take in during one visit.....I mean really, they have a vintage spoon chandelier. I just want to move in here and call it a day. 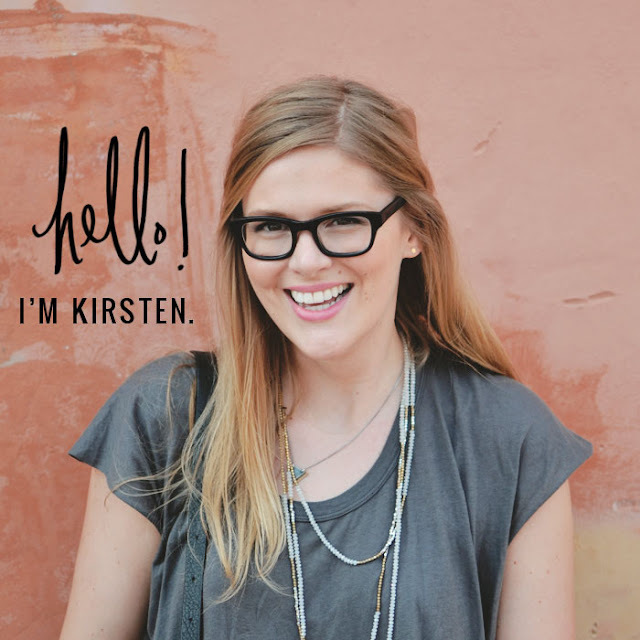 Kir, this sounds like such a blast to do with your folks! nice get away in the sunshine too, so good. 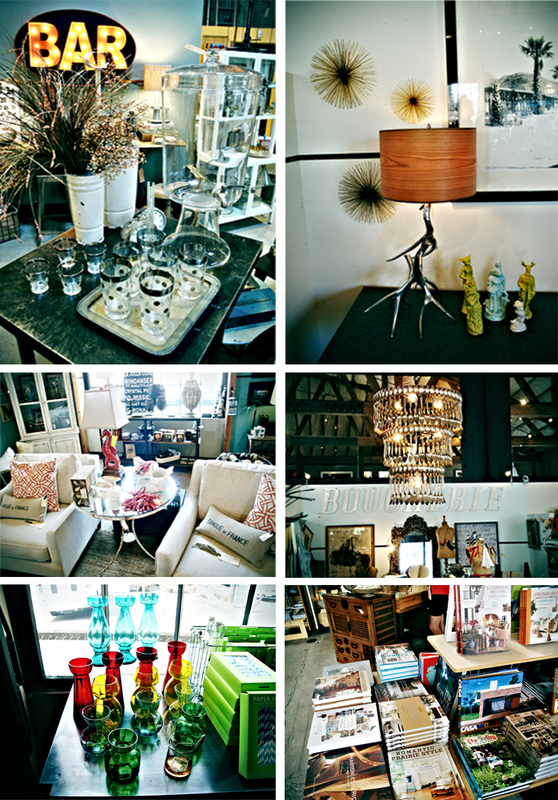 lovely interiors and looks like you would have been eying everything up and down for potential purchase. i love the BAR sign. Looks like an amazing place with lots of goodies! I didn't know you were in California! Hope you're having a blast. Soak up the sun while you can because you're coming home to rain and more rain. Yaaaa I'm so excited our store made the "list"! The rustic rooster proves to everyone that you can still have that classic coastal style & not break the bank! A true Tradition in Encinitas... Thank you! We're Thrilled!!!!!! This stores are some of MY personal favs too! I feel lucky to live here and shop all of them often!! this store is amazing!! I want to go...! !